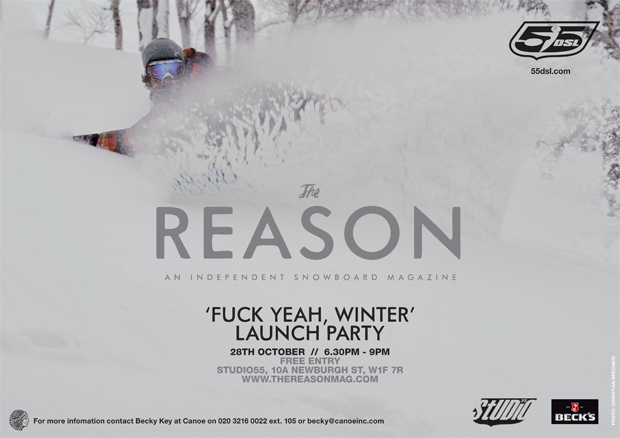 Tonight is the launch of issue 2.2 of independent snowboard magazine The Reason. I’ve never been a massive snowboarder, but even for me, this magazine is a beautiful piece of work and in my opinion, displays the sort of quality and content that all magazines should strive to achieve. For those who are fully involved in the snowboard scene, the mag contains extensive gear guides to help you figure out which bits of kit you need for your next trip to the slopes, and for those of a more voyeuristic nature, there’s plenty of amazing photography and insightful interviews to keep you entertained, and learn a lot more about the sport while you’re at. The newest issue of The Reason (number 2.2 to be precise) launches officially tonight at the Studio55 space at the 55 DSL store on Newburgh Street. Full details on the flyer above. Come down and embrace Winter!